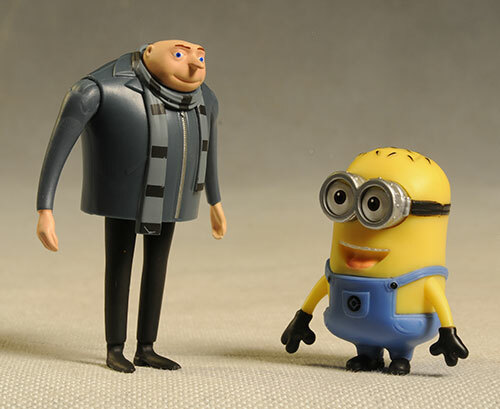 While I think Monster University has real potential, the animated film I'm most looking forward to is Despicable Me 2. The original was a terrific surprise, and the previews for the sequel have me geeked. Thinkway is doing the toys, and they are always an excellent choice. Earlier, I looked at one of their electronic Minions, but tonight I'm checking out the much smaller - and much cheaper - PVC figures. There's several of the standard minions - Dave, Phil and Stuart are the three I'm looking at here. They also have a bunch of these guys done up in various outfits, but I have no idea if we'll actually see them in any of these costumes in the film. I also picked up Grue, but Dr. Nefario was no where to be seen. He's the one other figure that I really have to find, but I suspect he'll be in demand. I grabbed these at Toys R Us, where they run around $10 each. Check the Toy Story aisle. 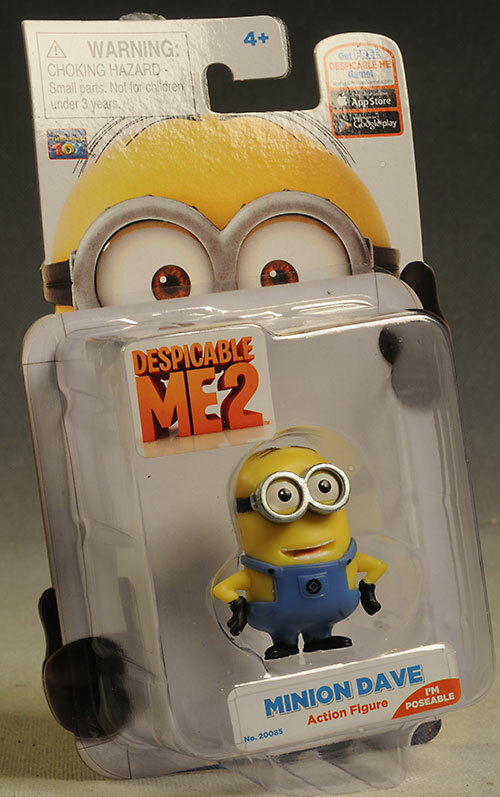 The bubble and card back packages are cute, and the minion holding it from the back is very cool. There's some character specific personalization on the back, and while these aren't collector friendly, there's no annoying twistie ties or rubber bands. 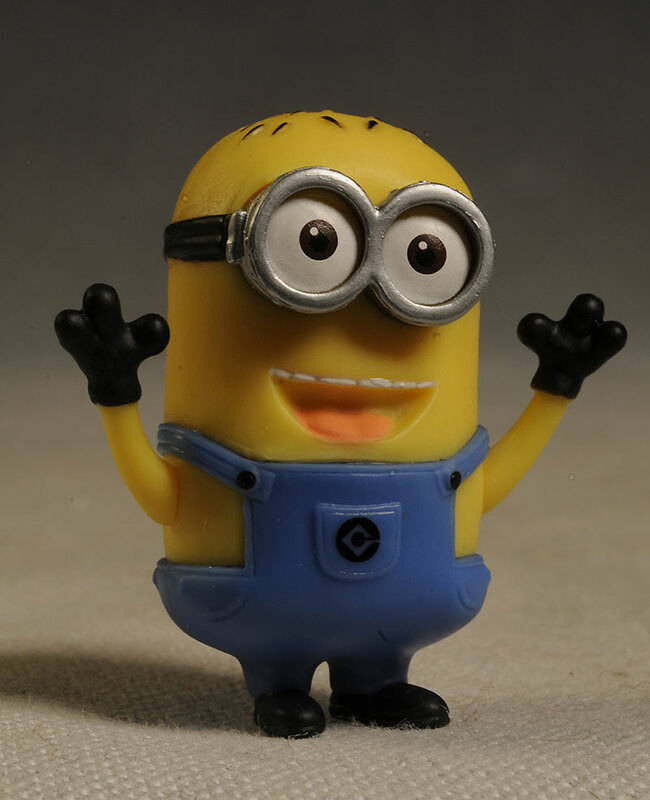 I like the sculpting on these, especially the minions. The look is unmistakable, and while they still have the hair plastered right to the head (even Dave should have it up off the scalp a bit), it's understandable with a small PVC like this. The three have unique expressions that go beyond their one or two eye configuration, and all three are happy campers. That's a personality trait of every minion - Grue must be a great boss. 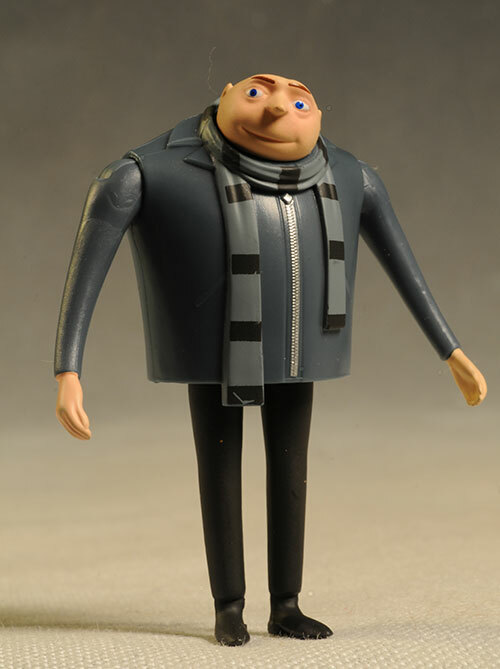 Grue looks very screen accurate as well, right down to the skinny legs, chunky body, and hawk-like nose. All the figures stand great on their own, but I do have an issue with scale. 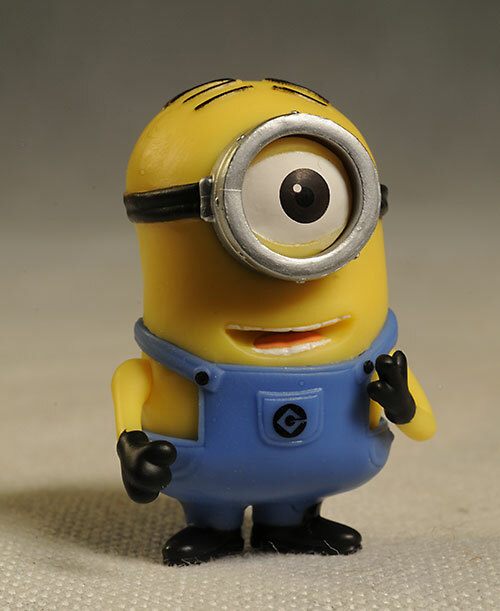 Grue stands 3" tall, while each of the minions is about 2". For this to work visually, Grue really needs to be closer to 5", and putting them together on the shelf isn't going to work. It's important to keep in mind that these figures are only 2" tall. Considering the scale, the paint work is quite good. The eyes and teeth are clean and neat, and the yellow and blue are consistent in color. There is a little glop and slop in the silver, but that's always a tough color to pull off. Grue is good overall as well, especially the very tiny eyes and eyebrows. PVC's are generally not articulated at all, so any score here above a Bupkis is a positive thing. These guys all have cut shoulders, and Grue adds a cut neck. This means you have a couple arm poses that you can do, especially with the minions. It's not much, but it's more than you usually get with a PVC. There's nothing extra, but with a small PVC like this, that's pretty normal. They're fairly basic little figures, but these are just the sort of thing kids can have a great time with. The minions are particularly good for play, because while there isn't any of the traditional conflict, they can be abused Three Stooges style. Ten bucks for a 2" PVC? I don't care if the arms are articulated - that's way too much scratch. 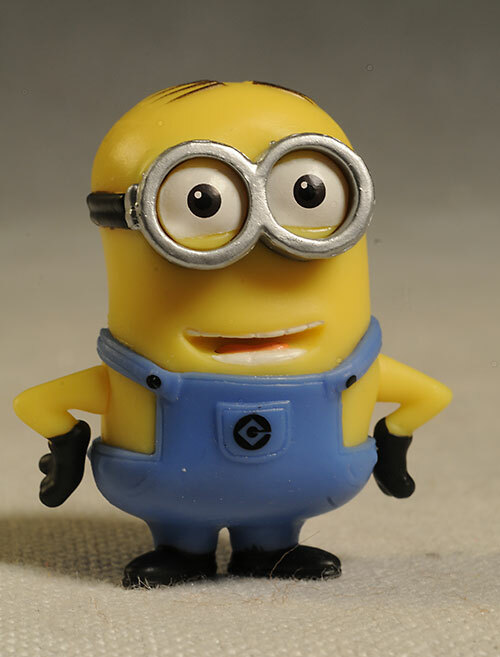 I love little PVC figures like this, and they've done a terrific job with the standard minions. I'm not too keen on getting the others in the various costumes, unless we see them on screen, but Dave, Phil and Stuart will look great hanging out in your cube. 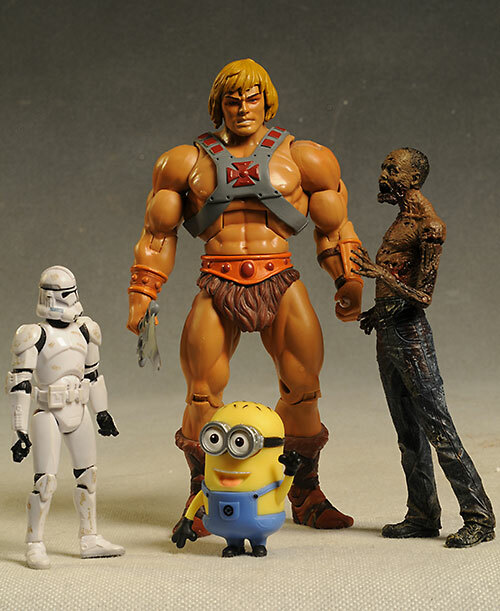 I'm a little disappointed with the scale issues between Grue and the minions though, and really wish we had a larger version (as well as a bigger Nefario) to go with the little yellow dudes. I'm even more disappointed with the price tag. With a bunch of little characters like this, you want to have them all, but at $10 a pop, it's probably not going to happen. Your best bet is to hit your local Toys R Us, where these will run you around $10 each. They have a ton more too, but they are wearing various costumes. Just a couple weeks ago, I checked out the very large (and more expensive) electronic minion, which was very cool if you have the cash.